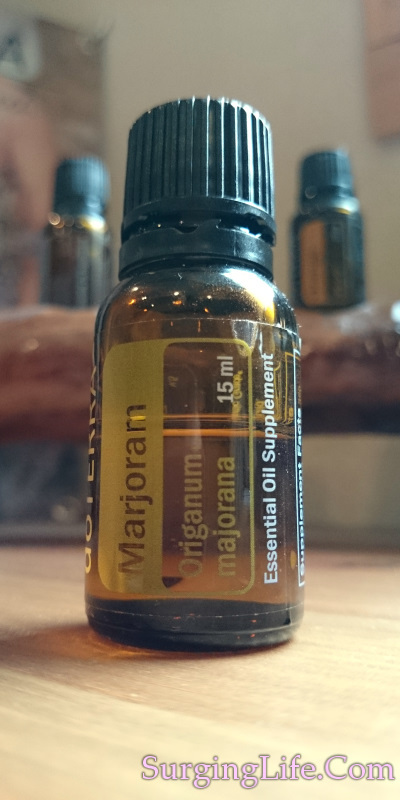 Marjoram essential oil comes from Origanum majorana, which is also known as sweet marjoram or knotted marjoram. This warming, woody and slightly spicy aromatic oil is good for a variety of conditions, with its common uses including pain relief for muscles and rheumatic issues, stress relief, release of nervous tension and also general support of a health nervous system. Due to the beliefs in ancient times the “major” as in “majorana” was given to it due to the belief that Marjoram increases longevity, which by way of its therapeutic properties it can certainly aid with. More on the therapeutic value and uses of Marjoram essential oil can be found further down this page. Origanum majorana is a perennial herb of the Oregano family which is indigenous to Cyprus and southern Turkey, and is sensitive to the cold. It can grow to around 60 centimetres in height and has leaves which are 0.5 to 1.5 centimetres in length, and 0.2 to 0.8 centimetres in width, and are smooth, simple, petiolated, ovate to oblong-ovate in shape. The texture is extremely smooth due to the numerous hairs on them. The flowers produced are small and vary from purple to pale lilac when in season. Marjoram oil is often extracted by steam distillation from both fresh and dried leaves and the flowering tops of the plant, though the best quality oil comes from using the flowering tops only. The oil itself is yellow or amber in colour, though darkens to an almost brownish colour with age, and has a thin or watery viscosity. The aroma itself has a middle note with a warm, nutty, slightly spicy and camphorous aroma. The principle constituents which yield its therapeutic values include pinene, origanol, camphor, borneol, sabinene, p-cymene, terpinolene, linalool, cis-sabinene hydrate, linalyl acetate, terpinen-4-ol, y-terpineol, a-terpinene and y-terpinene. As an emmenagogue it should be avoided during pregnancy. This oil should be used in low doses due to its ability to dull the senses and causes drowsiness. In high doses the effect can become stupefying. Marjoram essential oil uses are many and varied, the principle uses which excel though are related to the nervous system and also the oils natural pain relief effects. Two things which combine to make it a useful aid in dealing with migraines, its sedative action also provides benefits here by aiding you to rest more effectively and clear the condition faster. A few drops used within a bath, or for massage, can be helpful in dealing with tired or over exerted muscles, easing the aches and any spasms that may be present. The combination of those two effects and the emmenagogue action can also be useful in dealing with menstrual issues, easing cramps, scanty periods and aiding with things like PMS. As previously mentioned the analgesic and nervine qualities come through very well with this essential oil, bring benefit to many conditions. In combination with its anti-inflammatory action this becomes a useful aid in helping with rheumatism and arthritis, especially when mixed with a carrier oil and massaged into the affected areas. Marjoram essential oil is great to use after a long and busy day, whether you work in an office or wherever. Busy days affect you in a number of ways, notably in terms of stress, both mental and physical, with shoulders and backs often becoming tense in proportion to the mental and emotional load that you have experienced. Marjoram helps to ease all those things in a holistic manner. It works on both the mind, calming and bringing it to a point of peace with effective stress relief. Whilst also aiding to ease muscular tension, which brings a deeper sense of relaxation and relief. This is ever increased when the oil is used in combination with relaxation activities such as meditation. The first things to note are points of safety, it should never be used during pregnancy as it is an emmenagogue. Also dosage should be kept low at all other times due to its sedative action which can induce drowsiness and a potentially stupefying effect in large doses. Those things said this is a highly beneficial oil for aromatherapy and massage for a number of conditions. It excels with issues of both the physical body and the mind, where it provides great effect for releasing tension. It is one of the oils which can be incredibly good if you have insomnia, with the nervine property easing away stress, anxiety and tension, while the sedative action assists you in getting into a good quality sleep. The best results in terms of stress relief, easing anxiety, clearing insomnia, rheumatic issues and all of the Marjoram essential oil uses come from using a good quality source. You will notice the difference when using a quality and good value oil. For tips and recommendations on accessing a good source with ease check the guide on where to buy essential oils.